An assortment of benign conditions can lead to TMJ problems, but so can a variety of cancers. 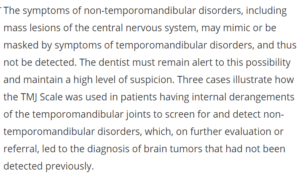 This is why if your TMJ pain hasn’t resolved despite dental-based treatment, you should request an MRI of your head, plus bloodwork, to see if there are signs of cancer or benign tumors. Dr. Panahpour explains, “Anything that’s a chronic issue on the system can become a cause of TMJ, including physical, mental or spiritual issues — can eventually become a cause of TMJ. “Many hormonal, thyroid, autoimmune and Parkinson’s patients develop TMJ. Overnight clenching and grinding of the teeth is called bruxism, and this is a well-documented instigator of TMJ disorder. “It can be caused by anything that causes a chronic stress on the body,” says Dr. Panahpour. Yes, there are cases of people who have been misdiagnosed as having a primary TMJ disorder—and treated accordingly—while the root cause of the TMJ and facial pain symptoms was a benign tumor or cancer. And all the while the cancer continued to grow until finally, the non-responsive TMJ symptoms triggered suspicion for a more serious cause such as an acoustic neuroma. An acoustic neuroma is a benign brain tumor that grows in the ear canal and can cause symptoms similar to TMJ disorder. When TMJ problems are the result of a primary and benign mandibular malfunction, a dentist with experience in orofacial pain and temporomandibular joint disorder should be the treating doctor. The dentist is the first medical professional that many people with new-onset, classic TMJ symptoms will see, especially since many dentists screen for this during routine exams. These symptoms include pain when chewing, and a clicking and/or grating sensation when chewing. Other symptoms include facial pain, ear pain and headaches. These can be caused by benign tumors and cancer. But cancer can also cause pain when chewing and a clicking sound. There are multiple types of cancer that can cause symptoms that very closely mimic those of TMJ disorder. Dr. Panahpour’s approach to dental health encompasses the patient’s diet, immune and structural integrity, plus all the traditional treatments of a conventional dental practice. 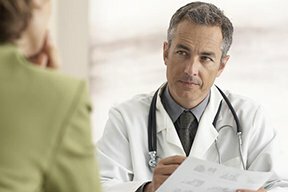 Can a Tooth Problem or Cavity Cause Eye Pain?